The longboard racing scene, whilst not huge, is stable and popular across the world. The boards are 380 cm long, with an 80 cm daggerboard, 40-55 cm fin, sliding mast track and a maximum sail size of 9.5 for men and 8.5 for women and youth. This monster setup is designed to give maximum performance racing upwind and downwind over the widest possible wind range from 3-30 knots. Only two sails are allowed per contest, so downhaul, outhaul and harness lines can all be adjusted whilst racing to give best performance upwind, reaching, and downwind in non-planing, planing and hang-on-for-dear-life conditions! Sailing upwind and downwind on massive kit in almost no wind then hanging onto the same stuff in 20+ knots might not sound that fun, but longboard racing is fun and rewarding. There are so many aspects that must come together to win a race, or even get around the course! Tactics (wind bends, gusts, shifts, other competitors, start line, tide, etc. ), fitness, equipment setup, technique, speed and that all-important focus. Originally published within the October ’17 edition. OK, so that’s racing, but what does it feel like to actually sail one? The extreme length of a raceboard results in quite a different feel to a conventional short board. Your freeride board is slow and draggy off the plane, but when that gust comes, the board overtakes its bow wave and suddenly accelerates onto the plane. A raceboard on the other hand, has glide and efficiency when not planing and as a result, getting planing is a smoother transition. The mastfoot is placed at the front of the long adjustable mast track off the plane. This maintains a flat and efficient trim. Once planing however, it is moved to the very back, bringing the sail’s centre of effort over the fin and allowing you to step into the rear footstraps and blast around just like on a ‘normal’ board. The real magic is upwind. With a massive daggerboard, it is no surprise that raceboards go upwind like a train. But there is more to it than just pointing it in the right direction. With a bit of technique, you can really fly. The key is ‘railing’. By pushing through your toes, the thick, parallel, leeward rail digs into the water, working with the daggerboard to provide extra sideways resistance and improved upwind performance. With the windward rail slightly raised, drag is also reduced and as the board accelerates, the daggerboard produces more and more lift. Before long, you are standing in the upwind footstraps on the rail, wrapping your feet around the rail, counterbalancing the powerful sail and vertical lift from the daggerboard. There is no feeling like flying upwind on the rail. On a slalom or formula board, you aim to fly the board and have the minimum possible surface in contact with the water. On a raceboard, you try to keep the whole leeward rail engaged with the water, that way you can sail at a tight upwind angle and slice through the chop. As a result, the stance aims to drive pressure through the mastfoot (to engage the rail and hold the nose down) and through your feet (to hold the rail at the perfect angle). Sailing a raceboard well requires sensitivity to trim, balance, and power – that is where I find the common ground with wavesailing. While the differences in the disciplines far outweigh the similarities, wavesailing really does require sensitivity to trim and balance. Sailing a small board out through the break without much power requires a very dynamic type of balance and trim, so does carving a nice turn on the wave face or adjusting direction to hit the lip in the perfect place. The pressure through your feet, boom, and mastfoot must continually change. A good wavesailor can plane without much power, yet stay in control when overpowered in rough sea conditions and maintain controlled manoeuvrability in both situations. A good raceboard sailor must do the same. How did I get into two such different disciplines? For me, it was a natural choice. Like many young windsurfers, I started out in my local Team 15 club. I got hooked on the racing aspect and ended up following the RYA Pathway. I raced in the Techno and RSX classes. At the age of 18, it became clear to me that a career as a professional RSX athlete was not for me. It was also clear that I wanted to keep course racing. 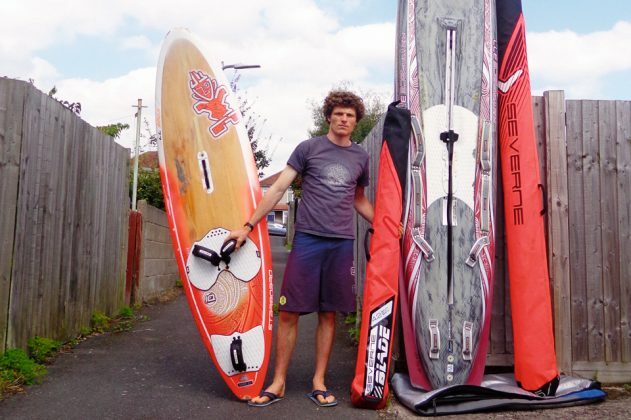 With a competitive and dedicated fleet in the UK and internationally, and a market of very cheap second hand boards, the Raceboard class was the best choice. Strangely, having lived the first 18 years of my life in Cornwall, wavesailing barely featured on my radar back then! I was given my first raceboard for free, I think it was almost as old as me! With the RSX sail I already had, I spent a couple of months getting to grips with the new board before entering my first UK competition. I saved up for a second hand Starboard Phantom and won most of the events I entered the following year. After this I was lucky enough to get the support of Tushingham Sails. They sorted me out with a new Tushingham XR-Race and Starboard Phantom 377, and in 2013 I amazed myself by finishing 3rd at the world championships. I’m very grateful for the continued support of Tushingham / Starboard and am now using the Severne raceboard sails and have just won my third national title. The aim for me at national events now is always to win every race, and to sail every race perfectly. I think that goal will keep me occupied for a while. I would also love to return to the international podium after falling short for a few years. My interest in wavesailing didn’t really take off until I started university, where my windsurfing depended on finding another windsurfer with a car. Most people of a similar level were interested in windsurfing on the sea, so that’s what I did (being able to fit a wave board in the corner of my room in halls helped too!). The Student Windsurfing Association (SWA) wave series was a safe, friendly introduction into wavesailing and as well as freesailing as often as possible, I started entering the occasional BWA event. 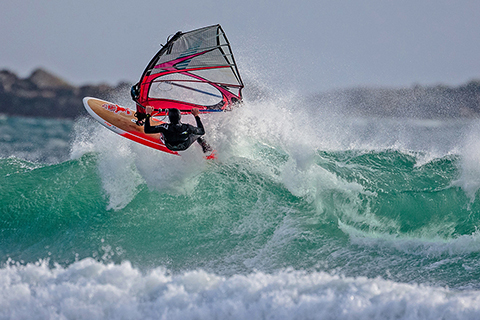 I won the Amateur fleet at the Tiree Wave Classic last year. I think my racing background definitely helps with wave competition. Although the format is completely different, being able to perform under pressure, stay focussed, and have that ‘will to win’ are traits that really benefit both. It can be hard to combine both disciplines, and I have to say that I spend more time on my wave board than on raceboard these days. However I enjoy both, each have their own challenges and there is always motivation to improve. 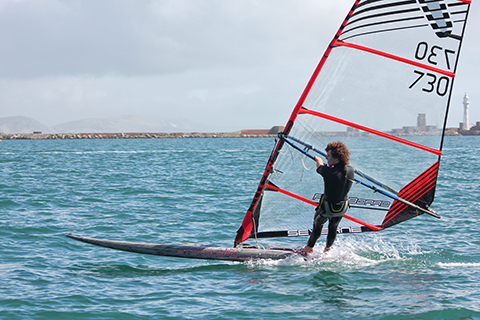 The RYA pathway doesn’t just produce Olympic medals, it produces young people who’s skills enable them to have fun in all kinds of windsurfing – Wave, Slalom, Freestyle, RSX, Formula, Raceboard, Freeride and Foil. I think it’s quite noticeable that ex-Techno windsurfers are progressing into a variety of disciplines now, and that can only be a good thing for the future of British windsurfing!